Sadly, the ‘Great British Summer’ has been something of a flop this year, with June 2012 being officially recognised as the wettest on record. While the weather may inconvenience the summer plans of many, the repercussions are felt even more acutely for individuals who work in the construction trade. Those with jobs to do outside will have seen many projects delayed, or even cancelled. It may, therefore, be tempting for workers to want to get stuck into a job as quickly as possible on those rare sunny days, but under such circumstances, it is essential that health and safety isn’t relegated to second place in the race to get the job done - particularly when it comes to working at height. In fact, it is of perhaps even greater importance that health and safety best practise is followed to the letter when working conditions are likely to be wet and, therefore, slippery. Working at height will never be without risk, but it poses a particular danger in wet and windy weather conditions and the most stringent safety precautions will be necessary. As long as jobs are properly planned and managed, however, with the right combination of equipment and training, the risk of an accident can be significantly reduced. According to independent regulator the Health and Safety Executive (HSE), falls from height still account for 16 percent of the 24,000 major workplace accidents that happened last year. In total, there were around 6,000 injuries resulting from working at height accidents that caused the injured person to be off work for a minimum of three days - so the implications are huge, not only for the wellbeing of your workforce, but to its productivity too. The disastrous consequences of not ensuring adequate health and safety measures became all too clear recently for a demolition company, fined £20,000 for neglecting to follow legislation. For the employee affected, however, the consequences were even more damaging. The company was fined in relation to an incident that occurred when a 67-year-old employee was left completely paralysed after falling from a roof. The employee was working on the demolition of a pub and was removing the slates and timbers from the pitched roof by hand. Although a mobile access platform had been provided to give the worker access to the roof, and to act as a barrier to prevent falls from the roof edge, the platform did not cover the whole length of the roof. The man fell 18-20 feet - equivalent to the height of a two-storey building - causing serious injuries including fractures to three vertebrae, his right elbow and both bones of his lower right leg. He also suffered a dislocated right hip and the collapse of his right lung. Cases like this provide a horrifying illustration of the devastating consequences that can result from failing to take all the necessary precautions when preparing for and working at height. The good news is that we are seeing a significant decrease in the number of working at height accidents year on year - better awareness of the risks involved, the training required and greater equipment choices, perhaps - but there is still more to be done to help protect our workforce. So what can we do about it? Working at height is undoubtedly a highly risky business, when not prepared for properly, but that doesn’t mean the job can’t be done. While there is always the possibility of an accident happening, there is a lot employers can do to minimise, if not eliminate, the likelihood of such incidents occurring. It’s crucial that contractors have the right guidelines and equipment in place to ensure that work is completed safely and effectively. It’s the right thing to do and employers have a legal obligation to do it anyway - but a safe workforce is also a productive workforce, so it makes sense whichever way you look at it. Working at height legislation has undergone significant change over the last two decades, and in 2005 falls from height were addressed specifically in the ‘Work At Height’ (WAH) regulations. These regulations focus on a ‘fall protection hierarchy’ and cover a comprehensive range of situations - from a worker on scaffolding on a building site, to a shop employee using a ladder to change a light bulb. They must be followed when undertaking any work at height to reduce the associated risk. The underlying principle of the hierarchy is this: when confronted with a potentially risky work at height situation, it’s important to first consider making it, as much as possible, less of a work at height situation. This principle is perhaps the one that is too often overlooked, but it’s simple. Don’t work at height if you think the job can be completed in any other way - and remember, working from height is defined as working from any place above ground level, which includes standing on the first rung of a step ladder. The HSE suggests workers should consider alternative working methods or equipment that help them get into those hard to reach areas without actually having to leave the ground. This may sound basic, but prevention really is better than cure, so it is essential that all other options are exhausted, and that the decision to undertake work at height is only as a last resort. If this is not possible and you must work at height, make sure you make it as safe and stable as possible. Employers should ensure that their workforce is fully and competently trained to do the job and provide them with the appropriate equipment in order to manage and control the risk and/or the consequences of a fall. But what exactly constitutes ‘appropriate’ equipment? You may be surprised, but there’s actually a really wide range of equipment that workers can use, each supporting different work at height scenarios in different ways. It’s important to choose the most appropriate method for the specific task at hand. Of course, ladders remain an extremely popular choice for workers. According to the HSE, ladders are often regarded as the easiest piece of access equipment to turn to due to the convenience factor. Although the ladder provides an immediate, no-nonsense access to a specific height, however, it isn’t always as appropriate as you might think. In fact, it might not necessarily always be right for the task at hand, particularly if you are working at height for long periods of time, or need to stretch to reach the working area. What’s more, according to the HSE, a third of all reported working at height incidents involve ladders, accounting for 14 deaths and 1,200 major injuries to workers each year - so it’s definitely worth weighing up the options first. It’s always important to consider ladders as perhaps safest used as a means to access a work platform, rather than as the work at height platform themselves. This is not to say that ladders should be completely disregarded. The HSE regulations prescribe that ladders can be used for low-risk, short-duration work, or where a risk assessment shows that other more suitable work equipment is not appropriate because of the location. There are, however, other options to consider, particularly if you’ll be working at height for more than 30 minutes, or need to be able to use both hands. For low-level activity, alternatives such as podium steps, pop-ups and power towers may provide safer and more effective means of access to working at height, while for higher jobs you could employ mobile access towers and powered access solutions like aerial work platforms, MEWPs and scissor lifts. There are also a number of innovative pieces of equipment that have come on to the market more recently, such as aerial work platforms that enable users to work at greater heights, and with a complete 360° range of motion. It’s important not to forget that any equipment should be used in conjunction with the appropriate auxiliary safety items, such as harnesses, lanyards, clothing, eyewear, guardrails, podium steps, ladder safety foots and winches - all of which will further reduce the likelihood of a fall from height. Whatever equipment you choose, ensuring it has been fully maintained, is safe to use and is 100% compliant with the WAH regulations, is just as important. The risk of injury when equipment doesn’t work as it should, or when it suffers from unaddressed wear and tear, is much greater. With such a large range of choice and such a weight of responsibility in ensuring equipment is safe and fit for purpose, contractors are increasingly choosing to hire their access equipment instead of investing in it themselves. In doing so, they can ensure quick and easy access to a vast fleet and wide range of safe and ready to use kit, without the need for capital expenditure that comes with purchasing equipment. In addition, kit always comes fully serviced and ready to use - and, by removing overheads such as transport, storage and maintenance, hiring is also often the most economical choice too. When assessing and preparing for the risks of working at height, one of the most important precautions to take into account relates directly to the employee and employer - this is the issue of training. The appropriate equipment is only as useful as the person using it, and it must be remembered that ‘only a bad workman blames his tools’. It’s important to note that you simply can’t just rely on the equipment to keep your workforce safe. Consider the case of a window cleaner who broke his ribs, arms and fingers after falling more than two metres from a ladder that wasn’t secured properly on a sloped surface. He had the right equipment but wasn’t using it correctly - because he hadn’t received the correct training. 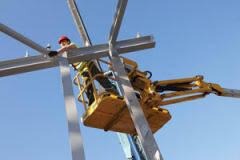 In all scenarios, including working at height, the Provision and Use of Work Equipment Regulations (PUWER) state that employers have a legal obligation to ensure that the person they employ is able to operate the equipment for the job correctly and safely, especially when carrying out such high-risk work. This means making sure they are able to assess the working environment and identify any potential hazards. It means making sure they are able to select the most appropriate piece of equipment for the job, as well as being able to set it up and operate it safely. It also means making sure they are fully aware of emergency procedures and processes. The best way to ensure employees have an adequate level of competency is to provide them with appropriate and thorough training. Training undoubtedly remains one of the most, and often the only, effective ways of sharing this expertise, and achieving health and safety compliant behaviour in the workplace. It is never enough to assume operatives will simply pick up safety ‘on the job’. Good training can ensure that workers understand how accidents occur, how they can prevent them and what their responsibilities are. It can also help integrate safe working procedures into everyday work life, and give workers the confidence to act safely and competently, even under time pressure, or in situations with multiple stakeholders where differing interests are present on site. Comprehensive training means not only a higher standard of safety but also a more efficient workforce. The good news is that people are recognising this. There’s been a huge growth in demand for health and safety training to provide a comprehensive range of off-the-shelf technical training solutions, and bespoke safety training courses for all scenarios. What’s more, although you can’t put a price on it, training need not be expensive, either in cost or time. Admittedly, working at height is dangerous - but when you’ve still got a job to get done, managing and controlling the risks will help to make sure it gets done safely. Ultimately, when it comes to working safely at height, the risks need to be fully assessed and the appropriate precautions taken in order to reduce the risk of potential accidents. Accidents and injuries can be minimised or avoided by following the Work at Height guidelines: ensure the appropriate equipment is used, making sure it’s in full working order, it’s being operated by workers who know how to use the equipment and who know how to do so safely. It genuinely is possible to work safely at height through a careful combination of using the right equipment, and having the appropriate training to go with it. In summary • Work at height should be avoided where possible • In cases where work at height cannot be avoided, the appropriate equipment must be used, meaning equipment that is the safest and most suitable for the job, that is well maintained and in full working order, and supported by appropriate safety wear • Further measures should be taken to minimise the distance and consequences of any fall • Workers must receive comprehensive training - the more training, the better the likely outcome If these precautions are followed - no matter if a worker is working on a roof from a 2.5m access tower, or cleaning a wall from the first rung of a step ladder - the risk of an accident when working at height can be reduced, and employers can stop their operatives from becoming just another statistic.